Over the next few weeks, after coming back from the Craft & Hobby Association in California, we are enthusiastic with new ideas and yarn inspiration. This is a behind the scenes trade show where it’s the manufacturers, distributors, retailers and designers that come together. This show is massive as it’s preview to what is coming for the current year. These shows are typically guarded to not allow photographs or publicity. There is a general rule on the show floor that pictures are not allowed. You can approach the exhibitors and ask for permission to see if they are willing. Luckily for us, three yarn exhibitors granted us permission and walked us through the their new yarn lines . We were allowed to take as many photos as we wish. We would love to thank Red Heart, Lion Brand Yarns and Bernat / Patons / Caron Yarns for their permission and generosity of their time. This show is for buyers for all levels of retailers, including large chain stores of all crafting genres to get previews of the products to make decisions about buying new products for stocking shelves. It’s rare to see a behind the scenes of these types of trade shows. A lot of money is spent at these types of shows as presentation and inspiration will make or break a products launching success. It’s usually shows like this when a new product or idea is introduced and buyers make a decision whether it’s good enough for a store or whether a product doesn’t get off the ground and it will never see the light of day. It’s extremely competitive and exhilarating at the same time. Truthfully speaking, a yarn company would love their entire yarn lines on every possible store shelf in North America. 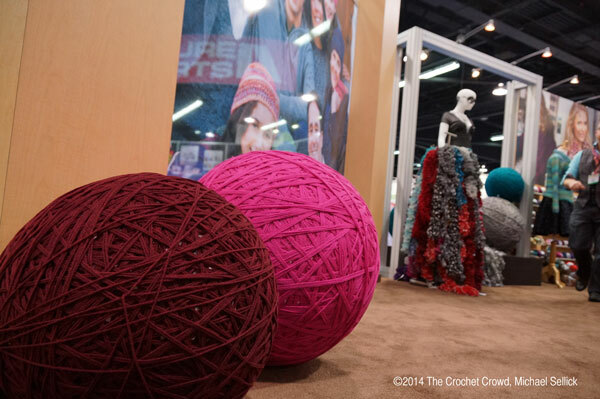 Buyers have only so much space in their yarn departments for new products. Usually if new products are introduced, older products that has been out may be discontinued at the store level for particular stores. Typically, the yarn is still available at other retail locations and available online yarn stores for years to come. Buyers are looking for products that will have the best value and a high turn over rate. From my vantage point of running The Crochet Crowd, I have seen many comments about ‘yarnies’ being furious that yarn brands have been discontinued and are no longer being made. In most cases, it’s just a local store or a chain that has changed their products on the shelves. The brands are still available else in other stores and most definitely available on online yarn shopping websites. I have seen time and time again that people believe that Super Saver only has a hand full of colours, when in fact, there are a 120 colours in the line to choose from. Many don’t realize that there are so many colours in the brand that they don’t know even exists. In today’s economy, the online yarn shopping world is required for the consumer to have access to ALL of the colours and yarn possibilities. It’s why most yarn companies have online shopping stores. For those who are not connected to the internet or being able to view the main website to see all of the yarn possibilities, they may not be realizing that there are literally hundreds of choices that we they may never know about as local stores don’t have the space to stock it all. For me, on a personal level, with the yarn stores being far from my home, online shipping saves me a lot of gas and my time. Most times I can find an online deal of free or discounted shipping too! Or maybe the yarn is on sale and the shipping rate makes up for it to be scoring the yarn at a regular normal price. The advantage online is that you don’t need to drive a huge distance for yarn that may be sold out at the local store. I have found it pays to ask the question at customer service to express interest in products you don’t see on the shelves. Especially Mom and Pop Yarn Shops who are eager to please. I find many of the yarn shop owners I go into, they don’t even realize that new yarns or even trusted yarn lines that have been out for a while are great products to have available at the store. I know one yarn shop, I talked to them about carrying Red Heart With Love. I expressed my love for it and why I thought it was a great yarn. They have since brought in the yarn and it’s a keen seller in their store. They have been surprised by the interest and it’s a keen seller today. There are so many choices, unless a consumer speaks up, they may not even realize what they are missing. This entry was posted in Advice & Tips, Yarn and tagged CHA, Craft & Hobby Association, Crochet, Lion Brand, Mikey, Red Heart, Yarn, Yarnspirations. Bookmark the permalink. Buying yarn online! Now if I could just find a Doctor that made house calls I would never have to leave the house again. I recently ordered yarn from the e-tent. It was the best deal on yarn I haver ever got. Even with shipping I average about $1 to $2 per skein of some awesome yarns and colors I’ve never tried. If you get a chance, next time your there at the tent Mikey, would you please thank them (especially for all the freebies-many pattern books and some nice bamboo knitting needles, and free crochet hooks-oh my). They have opened my eyes to experiment. I’d make the recommendation to buyers-get what you need when you order as it may not be there the next week. Thanks again.